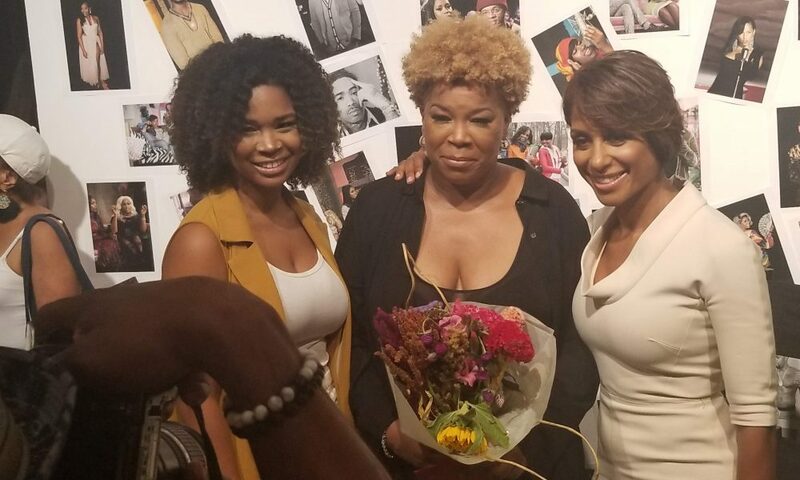 There was nothing but love, admiration, and support for Celebrity Photographer Rowena Husbands as she celebrated 25 years of amazing work at One Art Space in New York City. The Raw, Reel & Untouched photo exhibit took place to kick off fashion week and launch Rowena’s nonprofit organization “We’ll Comfort 4 U”, which provides aid to Senior Citizens. New York’s WABC news anchor, Sade Baderinwa had a one on one interview discussing Rowena’s experience and career. The event was sponsored by Bartenura, Myx Fusions and Monami Entertainment by Rowena’s longtime friend and mentor Mona Scott-Young and music by DJ Mary Mac. It was a who is who in the industry that filled the room to support their friend, colleague and loved one Rowena Husbands. Friends and supporters included 50 Cent, Yandy Smith-Harris, Monifah, Ronnie Wright, Mona Scott-Young, Robin Dunn, Irene Gandy, Carlos Greer, Partick Riley, and so many more. The photo exhibit was an intimate gathering of support and admiration for a woman standing in her own lane within a predominately male industry. There was wall to wall coverage of portraits of celebrities from the various projects Rowena has been a part of as well as her own photography business, Blink of an Eye Photography. Rowena’s classic and celebrity photographs covered the walls and proceeds in support of her new nonprofit organization. “We’ll Comfort 4U” will be a nonprofit that Rowena is starting to help people with elderly parents in nursing homes to help provide them with caregivers and other necessary resources to give comfort while being away from home. As a creative/artist, you create your own platform and can utilize it by any means. We must keep in mind, Rowena is utilizing her platform to bring awareness to an issue she is experiencing personally. Realistically an experience we all may have to face one day and that is taking care of our parents. It is a cycle the will repeat itself and can be extremely difficult for some. But all it takes is that one person to be a changemaker to assist others going through similar issues and obstacles. Rowena’s daughter, Tra’Lynn gave a speech on how proud she is of her mother. One thing to know about Rowena is that she is always speaking about how proud she is of her pride and joy. Watch as we captured that moment that touched everyone and is sure to get you a bit teary-eyed. Hug your children, love your parents! “We’ll Comfort 4 U” will be a nonprofit organization that Rowena is starting to help people with elderly parents in nursing homes to help provide them with caregivers and other necessary resources to give comfort while being away from home. For more information on “We’ll Comfort 4 U” or for donations contact wellcomfort4U@gmail.com.